All those things are true, but that last part “. . . as quickly as possible” is what makes Photo Mechanic such a hit for me. Ever shoot a few hundred or a few thousand images in a day? Do you shoot in RAW format and hate waiting for the those 100% previews to load in Lightroom? Do you need to view your photos faster? If you said “yes” to any of these, then you will see an immediate benefit to putting Photo Mechanic in your workflow. Photo Mechanic gave me a much easier method to importing large batches of photos. Previously, I used Lightroom for all my organizational, image review and editing needs. The biggest problem with that workflow is that Lightroom takes a long time to load 100% previews of images. While I can batch load these previews as I eat lunch, there’s really no sense in asking Lightroom to do that so I can check focus on dozens or hundreds of images. With Photo Mechanic, I drop the photos from my memory card to a folder on my desktop and open them up using the file tree on the left side of the Photo Mechanic interface. RAW files load instantaneously – regardless of whether it is hundreds or thousands of images. I think around 3000 is the most I’ve had in a single folder with Photo Mechanic and it didn’t even hiccup. I generally go through a first pass rating images that are useless, then on a second or third pass I’ll take a look at more interesting shots by viewing them at 100% to make sure I’ve got good focus. And, this is where Photo Mechanic really shines. I can view photos at 100% as quick as I can click through them. I can grab ahold of the images with the cursor and move it around the frame at 100% view without any hesitation. For viewing and sorting images, Photo Mechanic is just so much faster than Lightroom. Don’t get me wrong though, Lightroom is still my go-to photo editing software, but it just can’t be all things in all situations. And, in many cases, I still use Lightroom for importing images. When I start to get in the hundreds of images territory though, Photo Mechanic is the obvious first step. I’ve had my hands in wedding, sports and stock photography at some point or another, and I can see Photo Mechanic as a major time saver for pros in each of these specialties. Additionally, I’ve never been in a press room where I didn’t see someone using Photo Mechanic to sort and caption their photos prior to uploading to a wire service. It’s just too fast to waste time waiting for editing software to do something that Photo Mechanic can literally do 10-times faster. The other major benefit to Photo Mechanic is the ability add metadata to the images, which sports and stock photographers would definitely benefit from. I’m the world’s worst at preaching the use of keyword and description metadata, but I’m a lot better at it now than I was a couple of years ago. That said, if you are shooting enough photos to benefit from Photo Mechanic’s image review speed, then you need to be adding metadata at the point of ingest anyway. The good news is that Photo Mechanic has a smart and very functional tagging and description feature. Heck, you can even add GPS coordinates to your images in the software. Some of the other cool features of Photo Mechanic include Live Ingest, which monitors folders for new files and ingest them as they appear – think about wireless and tethered shooting. Photo Mechanic also includes the ability to burn discs or upload images/galleries via FTP or web services like PhotoShelter, Flickr, SmugMug, Zenfolio and others. I suspect this is part of what makes Photo Mechanic such a boon to sports and news photographers for quickly getting shots out to wire services. You can even export web galleries directly to HTML templates for self-contained galleries ready to go online. Photo Mechanic is a power user’s perfect organization tool; however, it still manages to offer a lot of functionality to the serious amateur who occasionally shoots a large batch of images. Photo Mechanic likely won’t replace any existing program in your workflow; however, it most likely will improve your workflow and save some serious time on sorting and keywording. Additionally, sorting and rating your keepers in Photo Mechanic can help keep your Lightroom catalogs smaller, which makes Lightroom faster. And, if you’ll get in the habit of throwing away the non-keepers in the first place (something I still struggle with), Photo Mechanic can be a gatekeeper to stretch your hard drive space further as well. If shooting lots of photos is what you do for a living, then you probably already have Photo Mechanic. If you’ve never tried it and you shoot enough photos that you’re wondering whether it is worth your while, I would suggest giving it a try at least. Camera Bits currently offers a free 20-day trial on Photo Mechanic so you can kick the tires and see if it’s right for you. You can download it on Camera Bits’ website. Thanks for the readable and informative review. I haven’t tried Photo Mechanic yet, but my workflow could sure do with a brush up. I like the idea of RAW files loading quickly. Will take a look at PM. Helpful article. Cheers. I exclusively use Lr 3 for managing and editing my amateur photography pursuits and have noticed how the application (even running on a quick Mac) seems to get bogged down during import. The idea of using another piece of software that would allow faster work up front (deciding keepers from trashers, etc.) sounds great. Until I find out it’s $150. I’m not saying it may not be worth the money, but that’s a fair bit of cash to pony up after having spent $275 to acquire Lr 3. Forkboy – Check out FastStone Image Viewer. It’s completely free, though once you’ve used it and have seen how fast it is, you’ll want to donate at least a little something to the developer. FastStone has great speed, especially with RAW photos. It’s meant to do the same image review type work that you’d use Photo Mechanic for. The only con of FastStone is that you can’t do a whole lot with EXIF information; there is EXIF viewing but only minor editing. Also, while it catalogs images, it’s mainly for fast thumbnail display. It has batch processing for resizing, watermarking, and color adjustment, and has a basic set of image editing tools – all color-related. 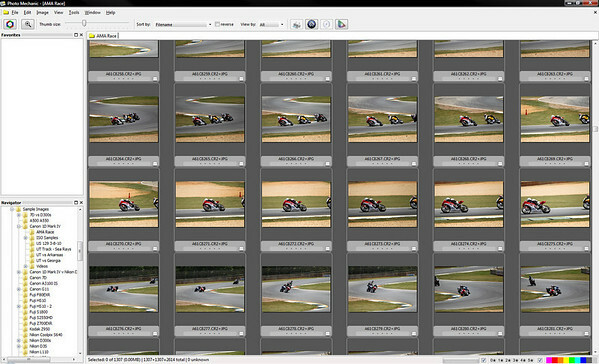 I use FastStone for my image reviewing, sorting and tagging after I import photos with LR3. If I have any ‘real’ editing to do, I load up Photoshop. For fast photo review and filtering, though, it’s VERY fast, and again, it’s free.